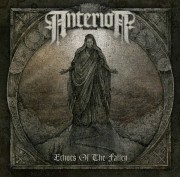 Welsh melodic death metallers Anterior launched their second single “Blood In The Throne Room” from their upcoming second album “Echoes of the Fallen” exclusively on AltSounds.com last week. For those that have yet to hear it, click here now. Set for release in Europe on August 26, the UK August 29 and North America on September 13 via Metal Blade Records, the 10-track long player was recorded at Grindstone Studios through 2011 with Scott Atkins producing. New Music: Anertior Premiere Third Single From Upcoming Album "Echoes Of The Fallen"